Modern topographic maps of California’s coastal region were needed as part of the State of California’s plans for adapting to sea level rise. 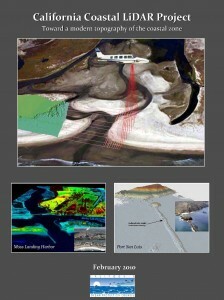 While working at the Ocean Protection Council, I developed a $3.3 million project that combined cutting-edge mapping technologies (LiDAR) and high-resolution photography for the state’s coastline. I coordinated more than a dozen state and federal agencies and academic groups to establish standards for the project and wrote this report to describe the project goals and key participants. The report is the first publication of the project. Although targeted to politicians and technical users of the future maps, the report was virally spread by listservs, blogs and newsletters. It went international, and a journal based in the United Kingdom ran it as a feature article. The project began in June 2010 and received extensive media coverage, including the San Jose Mercury News, CNN Radio, the AP, NPR and local TV stations. I was interviewed by many media outlets, and the story was run in the Washington Post and LA Times.